Zombies, and Fairies, and Super Heroes! But, Why? Kids are constantly trying to figure out where they fit in and to discover who they want to be. Halloween is the perfect holiday for your children to practice and experiment with these different explorations. As parents, we can be skeptical about Halloween because it revolves around excessive candy consumption with the occasional instance of tricking instead of treating. However, Halloween enables children to experiment with different forms of expression in a safe environment—an environment where everyone is dressing up and pretending to be someone or something new and creative. Celebrate Halloween as an adventure into your child's self-expression! • If your child wants to be a zombie, a ghost, a vampire, or some sort of creepy-masked creature, perhaps this is a good way for him to face some of the things he's scared of and gain more confidence by becoming one of these creatures himself. Plus, the creepy mask is only for one night. • Dressing up as a ballerina, a queen, or a fairy allows your child to admire these figures—whether they're real or not. Pretending to be one of these characters can foster an appreciation for a dancer's artistic expression or a queen's royalty and leadership role, and pretending to be a magical fairy stimulates and nurtures the imagination. Overall, putting on a crown or a tutu invites your little girl to dream of royalty and magic. It's likely that one day she'll realize that she'd rather be a lawyer or a painter instead of a fairy anyway. • Wanting to zoom around your neighborhood as a superhero (i.e. the popular Batman, Spiderman, Wonder Woman, or any others) encourages your child to tap into their own inner hero. They start to wonder how they can help make the neighborhood a safer place like Batman. They learn to connect to Spiderman, a relatable teenager who becomes a superhero. By putting on a cape or a mask, your child will probably be inspired to do some good too. 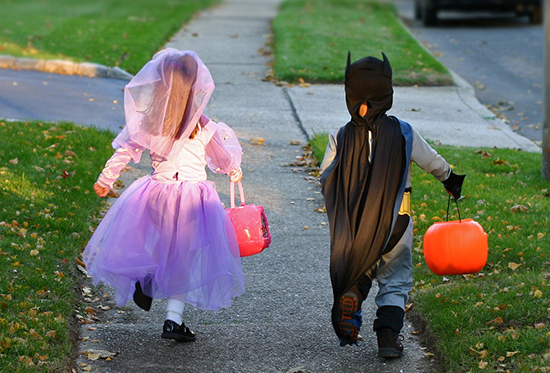 Surely children will continue to anticipate trick-or-treating with family or friends, but Halloween is also about inspiring kids to exercise their creativity and imagination, by getting crafty with costume ideas, while aspiring to dress up and become someone with qualities they admire. Wearing a costume can let a child express him or herself while also being comforted by the fact that he or she is only dressing up as a character or creature temporarily. Pretending to be someone or something is a freeing experience, especially when you know that the costumes, masks, and makeup come off at the end of the night.